The votes are in and the USA Challenge 2010 award goes — appropriately enough — to eVOTZ, a mobile electronic balloting technology. According to eVOTZ founder Elliot Klein, the winning application in the North American portion of the European Satellite Navigation Competition (ESNC) is designed to solve the problems of authentication and verification that have stalled previous attempts to create a secure and trustworthy e-voting solution. By combining GNSS, cell-ID triangulation and social-media integration, eVOTZ brings business opportunities while promoting the common good by putting elections technology literally into the palms of voters. Elliot Klein, a New York City entrepreneur who developed the patent-pending technology with Ian Gertler and Benoit Richard, sees uses for the technology ranging from government elections to stockholder proxies or any other activity in which authorized responses are required. “The eVOTZ platform mobilizes applications and business processes to improve the many dominant yet antiquated processes associated with voting, CRM [customer relationship management], and response-based communication channels today,” Klein says. “By leveraging the telecommunication industry’s leading technological capabilities and combining them with a web-based cloud-computing foundation, eVOTZ will transform how people and organizations get involved with and impact their businesses, communities and governments using what has become their main source of connectivity: mobile devices,” Klein adds. eVOTZ finished first among 24 entries in the USA Challenge. In addition to a $1,000 cash prize, Klein and his colleagues became eligible for a two-day consultation with the GNSS experts in the Position Location and Navigation (PLAN) group at the University of Calgary (Canada) Department of Geomatics Engineering. The eVOTZ voting system expands the use of GNSS sensors, cell-ID triangulation, and related geo-location technologies in wireless mobile devices to completely new applications of these technologies. Klein says eVOTZ addresses the entire market of official elections, corporate governance, and other response-based feedback mechanisms such as public opinion polls. The system uses subscriber identity module (SIM) technology that stores the unique service-subscriber key used to identify a subscriber on mobile devices. SIM-based polling and voting empowers people to voice and share their opinions and leverages the market for user opinions in many different environments, he says. Consequently, eVOTZ can improve on paper-based voting processes by providing a convenient mechanism with which to voice opinions and be counted. 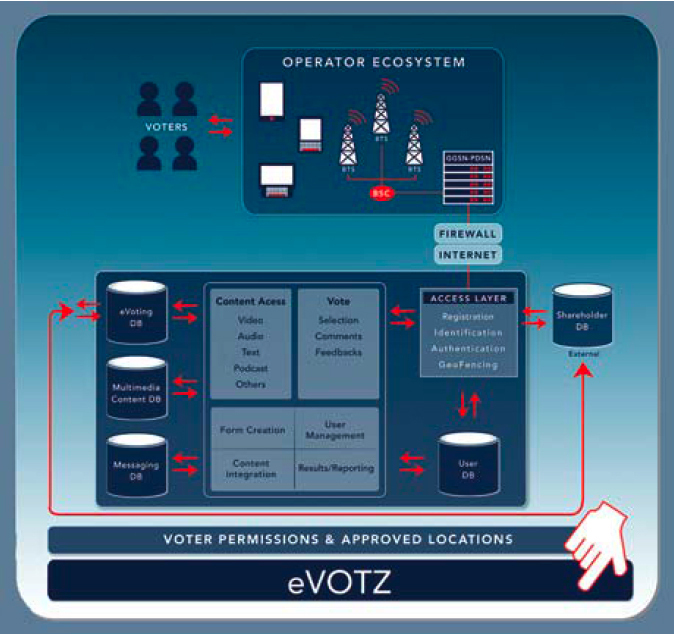 In developing eVOTZ, Klein envisioned a platform that could overcome problems encountered by previous efforts to deploy mobile voting and polling systems. The answer, he says, was to “geo-fence” a user within a designated distance to a predetermined location at the time of voting using cell-tower triangulation and assisted-GPS (A-GPS) positioning. An integrated SIM card enables eVOTZ to authorize and verify voting permissions. To accomplish this, Klein turned to a technical team with whom he had collaborated on past projects, including Gertler and Richard. Their answer was to incorporate geo-fencing for authentication and validation with asynchronous SIM-card technology tied to the Internet. As a location-based authentication and verification platform for enforcing “geo-denials” in mobile applications, eVOTZ leverages cell-tower triangulation techniques  through a mobile-web application programming interface (API) or downloadable application for existing smart phones and tablet devices. These can include the iPhone, Android, Blackberry, and others. Users of feature phones with less computing capability may use short message service (SMS) and short codes to transfer the ID verification and voting/polling information. The system integrates the same technology capabilities used by cellular phone network carriers in the United States to determine and report location in a 911 or other mobile phone–based emergency call. But while E911 services are always on, eVOTZ applications ask users — voters, shareholders or others — to verify their permissions in advance. Because voters initiate service activation, they maintain complete privacy permission control over location sharing, Klein says. eVOTZ employs many of the established industry protocols and techniques, which, Klein says, guarantees a secure, trustworthy, and reliable offering. These services can take advantage of embedded GNSS receivers or wireless mobile-carrier network–based technologies  such as cell-tower identification or triangulation from the location of the base station transmission cell-antenna tower to determine position at time of voting. Wireless network positioning technology provides for a sufficient level of location accuracy, Klein says, particularly indoors, where most voting takes place. Longer term, the company is developing newer GNSS positioning solutions in Europe — where new the European Gesostationary Navigation Overlay Service (EGNOS) can be used as well as future Galileo signals that offer authentication. The U.S. GPS Wide Area Augmentation System (WAAS) could provide the same enhanced accuracy for eVOTZ applications over North America. eVOTZ incorporates industry-standard APIs to simplify the launch of mobile e-solicitation proxy programs across mobile carriers worldwide. Klein says the standardized mobile platform can work across all mobile operator networks to ease the application of location-based response verification for such services as SMS and premium SMS short-code technology, mobile content, news, alerts and audio-video shareholder communication, with location-based response authentication and verification. The eVOTZ shareholder proxy vote platform is built on geo-location and APIs that enable vote-administrative servicing firms to define actions, and to allow voting automations to take place with confidence when the device and voter are in a known location. The application can be defined using rules and permissions stored in a server database. The eVOTZ system accomplishes cell-tower triangulation by interfacing with wireless mobile carriers’ base transceiver stations (BTSs), which contain equipment for encrypting and decrypting communication via cell-tower base station controllers (BSCs) to create a secure wireless ecosystem. Wi-Fi or cell positioning is appropriate for the level of accuracy generally required for successful use of eVOTZ — especially when users are indoors or GNSS signals are otherwise blocked or degraded. But Klein says GNSS maintains an air of integrity, especially for government and official elections — even more so in the case of WAAS or EGNOS. Future Galileo signals will incorporate integrity features that can make authentication even more robust. As illustrated in Figure 1 (see inset, above right), the database contains a registered voter and a geographical location for that voter’s postal mail delivery address; a means to receive a vote in an election over a wireless carrier network; a means to determine the geographical location of a device that transmitted the vote over the wireless network comprising cell-tower triangulation; and the means to reject the vote if the geographical location of the device that transmitted the vote is not within a predetermined distance from the geographical location stored in the database for the registered voter. eVOTZ provides both wireless carrier–independent and supported solutions to build applications to a standard set of APIs regardless of the provider’s requirements, handsets, operating systems, or enterprise integration structure. Other mobile API sensors can be applied to further verify, authenticate, and simplify the mobile voting process. These include durable computer-readable QR code, data-matrix code or related barcode image tags, or near field communication (NFC). Using the camera within most mobile devices, verification could also be obtained drawing signature-verification images from a voter’s driver’s license or passport or even images of the voter’s face. Klein says that by developing eVOTZ as a technology-, carrier-, device- and integration-GNSS-agnostic platform, these mobile applications can be leveraged by organizations, businesses, and governments in various environments and situations as a scalable and extensible method to gauge public opinion. eVOTZ technology also can add check-in features at government election locations, shareholder meetings, or other response-based venues using a pre-registered mobile device and personal password to cast a ballot or respond to polling. Such capabilities can be enabled as a stand-alone web-based application, an application downloaded to a user’s device, or integrated within a social-media service. Klein points specifically to Facebook Places, the reporting platform launched in March that allows Facebook members to push location-based check-ins or automated mobile location reporting to their profile wall. Klein sees this as a major integration opportunity for services such as eVOTZ. Facebook members who sign up for eVOTZ could start pulling information from Places, scraping it for data about their identity, location, groups, and so forth. Facebook also is working on enabling full support on mobiles for its Connect feature, which allows people to use their Facebook identification credentials to log into other Web-based applications. eVOTZ is exploring these areas for its API services and apps, but the opportunity to integrate eVOTZ services within burgeoning destinations such as Facebook, Twitter, and FourSquare opens new opportunities for trustworthy voting, polling, and feedback with hundreds of millions of active social media users, Klein says. Google Latitude is another new application changing the LBS market. Rather than dozens of applications each requesting your location, Latitude keeps track of a user’s location and “places” it in the Internet cloud. Once permission is granted, users can authorize third-party applications and sites such as eVOTZ to access their data without fees or costs. Klein says his company is launching with two main products. The first is eVOTZ Secure Vote, an authentication and verification platform based on real-time mobile voting device location. The platform registers and allows opt-in via mobile device to enable users to receive specific company proxy information and cast a vote or polling response directly from their devices on a mobile browser connected to a mobile carrier network. The second product is eVOTZ Media Share, which Klein says extends Secure Vote capabilities to localize communications for specific users through sponsored Internet information links and video messaging. This measurable serving and viewing of supplemental Internet content related to a voting event can enable proxy service organizations to report the success of delivery campaigns and charge fees for pay-per-click or pay-per-message services. One of the USA Challenge judges, Hans Kunze, praised the application, noting that the United States has a poor rate of participation in elections compared to other developed countries. “Anything that makes it easier for people to vote and actively participate has my endorsement,” he said. Kunze also thought that eVOTZ had “a great business case” with its “phased pursuit of vertical markets of increasing size.” He also pointed out that eVOTZ’s chosen hardware platform — smart phones — has a large rapidly growing number of users. “Writing a secure software app for [a smart phone] means taking advantage of a huge installed base. [There is] little technical risk, while a well-performing app means huge business potential,” said Kunze, a principal at KLA Global, a product development and strategic marketing consultancy. Beyond the initial product offerings, Klein says that eVOTZ is exploring new opportunities working with industry leaders, organizations, and universities. The company is working on mobile solutions for accessible voting technology to improve access to voting systems and technology for voters with disabilities. Klein believes that eVOTZ can help enable secure voting so that persons with a disability need not travel to a local polling place to cast a vote or ballet. CERAM ESC Lille Business School (Sophia Antipolis, Côte d’Azur), whose chairman has advised eVOTZ on business strategy. SIMalliance board, serving as business advisors on SIM card integration. Through the SIMalliance competition at the CTIA Mobile World Congress in Barcelona in 2010, eVOTZ established a partnership with mKratos — a SIM-based polling/voting platform developed in South Africa — to rapidly scale the eVOTZ platform in emerging markets, Klein says. The technology also has gained awareness and interest from the developed world, with Klein presenting voting testimony to the U.S. Election Assistance Commission (EAC). Meanwhile, NAVTEQ (a Nokia company) is advising eVOTZ on location-based apps, and Alcatel-Lucent and Microsoft are advising on implementing NAVTEQ map data. The University of Calgary’s PLAN group is assisting in eVOTZ’s focus on improving itswireless positioning and navigation technologies for outdoor and indoor voting and polling. eVOTZ currently has patent-pending status with U.S. Patent Application No. 12/635,847 and PCT International Application No. PCT/US2010/47503. For further information, visit the company’s website.